Ideas that are simple, clever, and something that I would actually do, make me smile. I've been crushing on all things glass lately and have 'passed on' and tossed out most of our plastic containers. 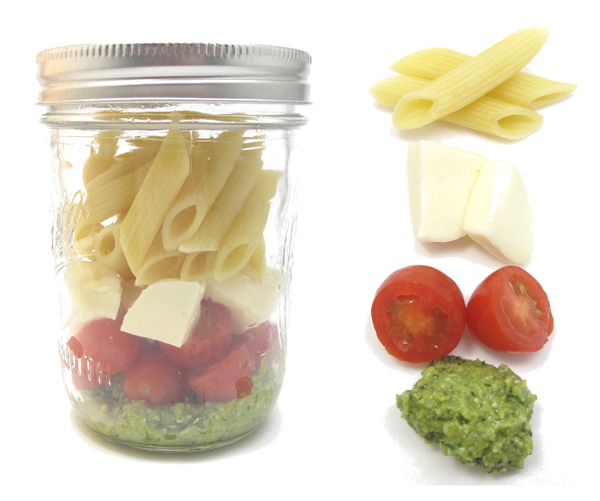 Aren't these 'Mason Jar Meals' the ticket for upcoming picnics?! This trend is adorable and I hate putting food in plastic so its a total win-win! I love this idea! I just posted about salad in a jar. Such a great way to pack an easy meal. This is so clever. I've seen it all. Perfect for a picnic! And also brown-bagging it for the office! Looks delicious. The only downside for me would be that glass is heavy to carry. But I could imagine this at a wedding reception picnic. How fun! I was just thinking about different cookie ingredient jars I could make. I never would have thought to make an actual meal in a jar! This is an amazing idea! Such a great idea for work/school. Looks delicious! Such a great idea. I'm also sick of those plastic containers. I would be just fine with getting rid of them all...ah how do you get rid of all that plastic? I would love to replace them with those glass jars. I can picture all kinds of layered fruits and salads!! Beautiful! Oh these is super cute...love the salad in a jar idea too! is there anything mason jars can't do? lighting, decor, storage, canning, and now pasta salads! love this idea! This is an amazing idea! I have a habit of collecting nice jars for no apparent reason... now I've found something to do with them!! and it looks so lovely!